Last week I was in Kuala Lumpur co-training a group of teachers in Cognitive Coaching, and while I was there a very interesting (and possibly scary) thing happened. On Day 3 of the training I set off to the school with my colleagues. We got into the car and instead of turning out into the road, which I was expecting, we drove around the building and through the car park at the back. I remarked on this change - only to be told that in fact we had taken the same route for the previous two days. I was floored! How had I not noticed? And what else wasn't I noticing from day-to-day life? Now there are many reasons why I might not have noticed our route to school. First of all we were leaving at 6.30 am and it was still dark. Also I remember on Day 2 I spent the first few minutes of the drive scrambling around in my bag trying to find my security badge that would admit me to the school so I wasn't looking out of the window at all. On Day 1 I was likely nervous and excited and more focused on conversations with my colleagues than on looking at my surroundings, however I still found this lack of awareness a bit disturbing. A couple of days after this, I was back in Mumbai again and taking my nightly 5 km walk around Joggers' Park. After several laps around the track, probably a little over half a hour of walking, the friend who was walking with me pointed to a woman at the side of the track who was skipping quite vigorously. She said "Wow - she's fit! She's been skipping the entire time we have been walking." Yet again I hadn't noticed her. Paying attention to my surroundings is something I guess I need to become more conscious of. 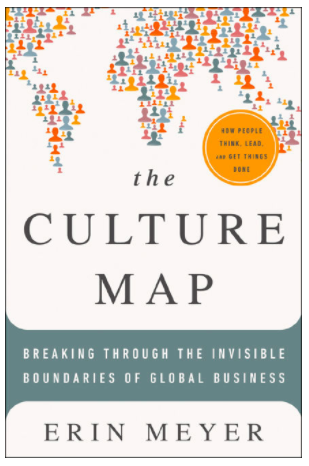 This week I started reading The Culture Map by Erin Meyer and so far I have got through the introduction and Chapter 1. The book is about cross-cultural misunderstandings caused by differences in the way we see things, basically because of invisible boundaries. I feel that there is a lot I can learn from this book! Each chapter deals with a different scale, showing how cultures vary, and misunderstandings happen when people expect one thing, but get something else. In my years living in Thailand and India most people expected me to act a little different, whereas during my times in the Netherlands and Switzerland I was more of a "hidden immigrant", and most of the local people expected me to act the same way as them. This was never more obvious to me after I arrived in Switzerland from Thailand on our first snow day. Although I'd set off for school that morning to blue skies, snow started falling mid-morning and by the end of school my car was completely covered. Not understanding Swiss snow, I cleared the windscreen and then drove home expecting that most of the snow on the rest of the car would blow off or drop off on the way. Unfortunately this didn't happen. I arrived at the underground car park of my apartment building, got out of the car and noticed the entire car was still covered in snow. Even worse, mine was the only car in the car park that looked like this. What to do? As I was pondering this, a man came into the car park on a bicycle. He stopped beside me and said "You're supposed to get the snow off before you drive in here." Er ... yes ... but how? "Don't you have a snow brush?" he asked me. Well obviously I'd never heard of this, but it's a vital piece of equipment that is supposed to be kept in the car during a Swiss winter. In the end I had to resort to scraping the snow off with my hands and then kicking it under the car so it wasn't so obvious that I had no snow sense. I prayed that it would all melt before morning, when I had to drive out of the space again. Now I could go on for an entire blog post about the differences I encountered between my expectations and those of the Swiss during my 3 years there, but interesting though this may be, let's get back to the Culture Map. Our cultural perceptions are so deeply ingrained that it's like asking a fish about the water it is swimming in - not knowing anything different he's likely to ask "What's water?" In my dealings with people from many different cultures I've certainly noticed huge differences in the way that people communicate. In my current job I mostly work with Americans who tend to be very explicit about what they want. Meetings are run with strict protocols and timed agendas and people talk a lot. I think that I used to talk a lot too, but since starting on my journey as a Cognitive Coach 4 years ago I've tried to do more listening and observing and less talking and I've noticed that some people actually never talk at all unless they are asked a direct question. In the book the quotation "you have two eyes, two ears and one mouth and you should use them accordingly" resonates strongly with some of these people. Chapter 1 addresses effective communication. In some cultures, such as American, good communication is about being explicit, clear and accurate. The responsibility for transmitting the message is with the communicator. In India, however it's much more about reading between the lines. Here the responsibility for transmitting the message is more of a shared one. Being a good listener is just as important as being a good speaker. In Japan they refer to "listening between the lines" when someone is talking as communicating messages without saying them directly is a deep part of the culture. In Japan there is even a word KY (kuuki yomanai) which means "one who cannot read the air" (not a good listener). My hunch is that most Americans would be seen by the Japanese as KY - which in turn makes me wonder about communicating with students and parents in international schools and how much "air" is not being read. Erin Meyer explains the different communication styles on this first scale are known as high-context and low-context. Americans are the lowest context in the world. This means that effective communication must be simple and clear in order to convey the message. In this culture you say what you mean and mean what you say. Presenters are often told "tell the what you are going to tell them, tell them, then tell them what you've told them." I think when I was training to be a teacher I was probably given the same message. Contrast this with the Hindi word "kal" that I came to know during my first year in India. This means yesterday, but it can also mean tomorrow depending on the sentence (and also because as many people told me in that first year - in India time is circular). Clearly India is much more high-context. There are historical reasons for these differences of course. High-context countries often have a long shared history and are relationship-oriented. For example Japan, the highest context country in the world, is an island which for much of its history was shut-off from the rest of the world. The USA, by contrast, only has a couple of hundred years of history and is made up of immigrants with different histories and languages who have little shared context. No wonder then that Americans need to be explicit and clear to avoid misunderstandings. However according to the Culture Map, being a good communicator is relative. If you are from a low-context culture you may see people from high-context cultures as secretive and lacking in transparency as you have to listen for what is meant, not what is said. If you are from a high-context culture you might find that those from low-context are condescending and stating the obvious. Clearly even simple communication can be fraught with difficulties if you don't understand the cultural context that different people are coming from. The next chapter deals with the many faces of being polite. I'm going to read this one tonight.